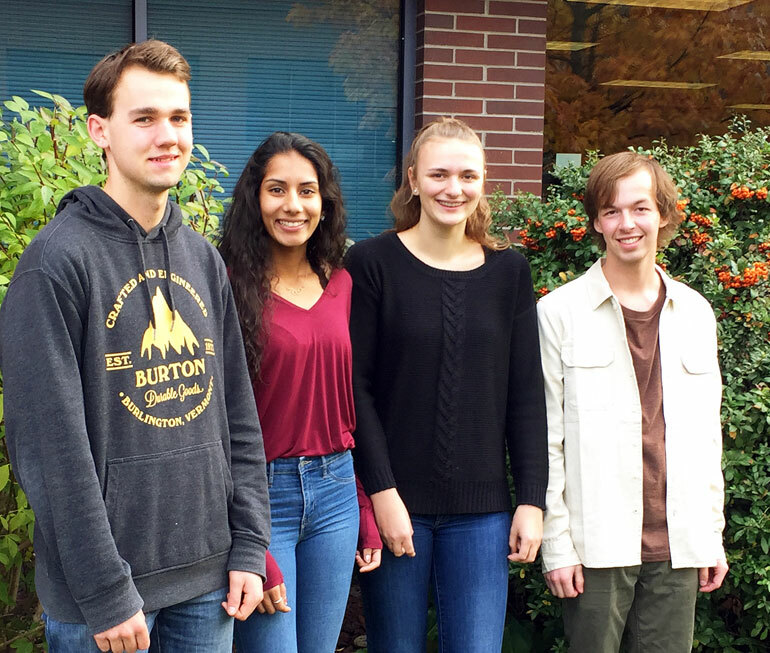 First-year Bachelor of Science students (from left) Thomas Girard, Gurpreet Saini, Alyssa Liegmann and Kohl Finlayson each received $2,500 towards tuition from the Rick and Yasmin Thorpe and Friends Scholarship foundation. It was 2006 when the Rick and Yasmin Thorpe & Friends Scholarship was established. Coming from the south Okanagan, the Thorpe’s goal is assist students living in that region—donating to two university-bound students each year who are graduating from schools located on the west side of Okanagan Lake, from Penticton to Killiney Beach. This year, they have provided a scholarship for four first-year students who will each receive $2,500. “Rick and I are pleased to be able to assist these students,” says Yasmin John-Thorpe. “They are our future, and we wish them all the best with their studies." Students who received a $2,500 entrance scholarship from the Thorpe foundations this year are Mount Boucherie Secondary School graduates Alyssa Liegmann, Gurpreet Saini and Thomas Girard. Kohl Finlayson, a Princess Margaret Secondary School graduate, also won a $2,500 Rick and Yasmin Thorpe & Friends Scholarship. All four students are working towards their Bachelor of Science degrees. Director of Development at UBC’s Okanagan campus Adrienne Nolan says awards like the annual Rick and Yasmin Thorpe and Friends Entrance Scholarship have helped grow the young campus by supporting the university’s first decade of students.